Ilwaco’s Ayden Cohen-Tjaden made an attempt in the shot put at last Thursday’s meet in Raymond. IHS freshman Sabrina Lessenden set a new PR in long jump with a distance of 10-feet-8 at Thursday’s meet in Raymond. Ilwaco’s Brady Vinsonhaler took second in the high jump at Thursday’s meet, clearing 4-feet-10. Ilwaco’s Colton McNabb set a new PR time of 12.20 in the boys 100 meters, good for second place at Thursday’s season-opening meet in Raymond. 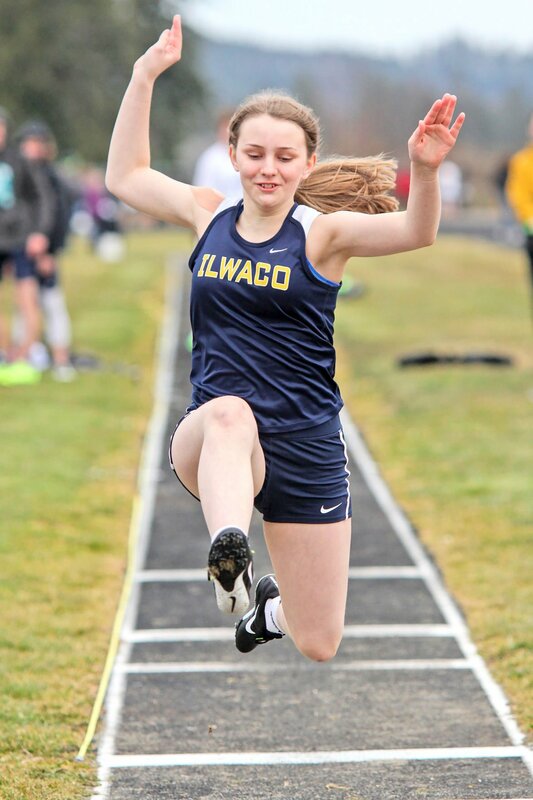 RAYMOND — The Ilwaco High School track and field team may have been a little short-handed at Thursday’s season opener in Raymond, but you wouldn’t have known it from looking at the results. The girls team tied for first with the Washington School of the Deaf with 111 points, while the boys team came in third with 93. It was PR’s aplenty for the Fishermen, as athletes set new personal records in 21 events. In her first high school track meet, sophomore Erika Glenn won three events and took second in another. She took first in the 200 meters in a time of 28.46, first in the 400 in 28.46, first in triple jump with a distance of 30-feet-4 and second in long jump with a distance of 14-feet-5. “Erika did not do a spring sport last year. She did very well in her events,” said IHS coach Sarah Taylor. Sisters Sophie and Alyssa Marsh also had big days, with junior Sophia taking first in shot put with a new PR distance of 29-feet-11 and javelin with a throw of 98-feet-1. She also took fifth in the 100 in a time of 15.32. Freshman Alyssa, in her first high school meet, took first in the 800 in 3:06.02, second in the 400 and third the 200. “Despite her recent illness, Alyssa had a great opening meet,” said Taylor. On the boys side, junior Tristan Trudell took first in the 1,600 with a time of 5:04.29 and placed second in the 800 in 2:18.98. He also joined Colton McNabb, Brady Rasmussen and Brandon Kuhn to win the boys 4x400 relay by almost 7 seconds. Kuhn also took first in the 400 with a PR time of 57.01. McNabb also set PR’s of 12.20 in the 100, good for second, and in the 200 with 25.26, also good for second. Junior Parker Kaech placed second in long jump with a PR distance of 19-feet-5.75, second in the triple jump with a distance of 38-feet-1.25 and third in the 100 with a PR time of 12.37. Junior Brady Visonhaler placed second in the high jump (4-feet-10) and fifth in the triple jump with a distance of 31-feet. Freshman Tazlina Thomas placed in three of her debut events, taking second in the 100 hurdles in 20.16, fourth in the 100 (14.63) and fourth in long jump (13-feet-6.5). Freshman Kaylee Barnett placed second in high jump clearing 4-feet and took fourth in shot put (25-feet-10). Freshman Sabrina Lessenden finished fifth in the 200 in 33.7. Rounding out the top five finishers for the Fishermen were sophomore Michael Rodda in fifth place in the shot put (32-feet-10 PR) and Dakota Shepard in fifth place in the discus (80-feet-6 PR). The Fishermen have 45 students on the roster, but with illness, limited practices for some due to state basketball and some academic issues, IHS was limited in the opener, but should have their full group in the weeks ahead. IHS has only five seniors on the team this year, including Alex Kaino Ebby McMullen, Bella Brownlee, Jose Mendez and Evan Perez. Kaino set a new PR of 40.3 seconds to win the 300 hurdles state title last season, while McMullen took second in the 100 hurdles state finals. Taylor also noted the strong core of freshman they have this year, including Daniel Quintana and Alyssa Marsh, as well as how much junior Daniel Whiting has been working in the offseason. “We have a good combination of students who have experience and those who are new to track and field,” said Taylor. The Fishermen will next see action Thursday at Naselle and will host the first of their two home meets on March 28.